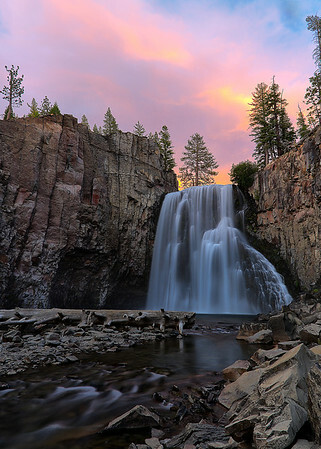 Rainbow Falls in Devil’s Postpile National Monument is one of the prettiest in the Eastern Sierra. I hiked here with my best buddy, Marc hoping for a nice sunset. We arrived with plenty of time to spare and after shooting around the falls, set ourselves up and waited to see if the light would grace us with color. Even though it was a terrible drought year, the falls had enough water to make for glossy streams in a long exposure, and enough mist that we needed to keep our lenses covered except when taking a shot. Thick clouds came through and with a mountain behind us, we couldn’t tell if the setting sun would be able to throw its colors against them. Then it began. First a faint glow of yellow, then pink and oranges melting into deeper purple and hot pink before the last of the light faded. It was beautiful. This image reminds me to have patience, but even then we are still at the mercy of mother nature.